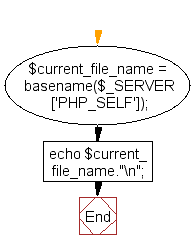 Write a PHP script to get the current file name. A computer file is a computer resource on a computer that stores data, information, picture, video, settings, or commands used with a computer program. In a graphical user interface an operating system displays a file as an icon. Previous: Write a simple PHP browser detection script. Next: Write a PHP script, which will return the following components of the url 'https://www.w3resource.com/php-exercises/php-basic-exercises.php'.